Last Friday, Tutubi flew somewhere, to a place in the heart of the Philippines for another serving of a seminar that took him in the past to Dagupan, Butuan, Zamboanga City and Lipa City, but this time a storm, Frank (with international code name: Fengshen), was ravaging his destination with nearby places experiencing strong winds and flooding. Getting to Terminal 2 of the Ninoy Aquino International Airport (NAIA) at 530 in the morning was a breeze, with the trip taking only 30 minutes from Quezon City. He, however, had to wait for his companions who arrived 45 minutes before boarding time, one had trouble with lighters to be given away to seminar attendees that had to be sent back to office since the items are considered dangerous and not permitted on board, and the last stumbling block was trouble with Philippine Airlines Excess Baggage fee that was lowered due to effective haggling skills (you thought you those fees are fixed?). Arrived in Cebu and went to SM City Cebu for the usual seminar items that needed to be bought, Tutubi just opted to stay in his hotel room, due to the rain, after finishing his official work to do instead of the the usual explore interesting places besides the usual tourist spots after a hearty late lunch at Golden Cowrie Native and a so-so dinner at Port Seafood Restaurant with all-you-can-eat buffet for only P299. The following day, he spent his day, again, at the hotel for the event that took him there, followed by dinner at Neo Neo and videoke at the Club Nyx KTV and Bar near his hotel. Third day, Sunday, was opportune as he and his companions learned of the news that Metro Manila was flooded and without power as well as surrounding provinces due to the wrath of Frank (International name Fengshen). News headlines on TV bannered the capsizing of a Sulpicio Lines' M/V Princess of the Stars, a ferry going to Cebu that sanked off Sibuyan Island in Romblon with about 700 passengers missing. Worse, all morning flights of Cebu Pacific going to Manila were canceled (as well as flights of airlines using small propeller planes like SeAir and Asian Spirit), while waiting for confirmation if Tutubi's flight via Philippine Airlines (PAL) will also suffer the same fate. Even without confirmation, early contingency plans were hatched should it require them to stay a bit longer that requires checking into a cheaper place to stay. Since it was learned that PAL's flights in the morning were merely delayed for an hour and arrived safely in Manila, they decided to check in at the airport at the appointed time and true enough, flight PR858 bound for Manila was declared delayed for just an hour, quite acceptable compared to passengers of other airlines whose flights were canceled (this might be due to PAL's use of larger A340-300 planes compared to the A319/A320 used by Cebu Pacific on the same route). From ETD of 315pm, flight to Manila flew to the sky at 420pm and arrived after about an hour at the Ninoy Aquino International Airport via Terminal 2. The flight was smooth and uneventful unlike stories of flight stewardesses on board earlier flights they described as scary. Tutubi decided to hitch a ride in his officemates car parked at Park n Fly (P10/hour 24 hours minimum), passed by the rotonda in front of the soon-to-be-opened Terminal 3, into Villamor Airbase, Fort Bonifacio, The Fort, and C5 and dropped off on Shaw Boulevard in Pasig City where he flagged a taxi going to Quezon City. EDSA, Metro Manila's main artery, didn't have the usual heavy traffic at 8pm but probably due to the slippery road, Tutubi saw two accidents: one was at EDSA/Ortigas Avenue where an MGE taxi ran through MMDA's pink fence and the other, a Mitsubishi Pajero, who may have hesitated which way to take on the Quezon Avenue flyover. Quite a long teaser post, eh? Typhoon Frank latest Update: As of June 23, Monday 3pm, Frank is currently moving out of the country but PAGASA said Frank would continue to bring rains to Luzon and the Visayas. Total death toll due to the storm in the sinking of the ferry is a sure slot in the Philippines' worst maritime disasters. 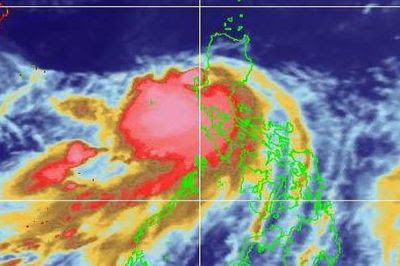 I hope everything in Manila is okay already despite raging typhoon.